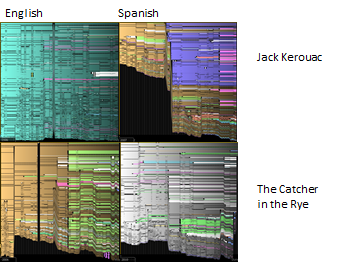 Both the English and Spanish results for Kerouac and “The Catcher in the Rye” are similarly detailed and color-rich. The global recognition of this particular author and this particular work is greater than that of the Onda writers, and it is important to take this fact into consideration. Looking at all of the images, to me, the English and Spanish versions of “The Catcher in the Rye” are the most similar. They both seem to follow a similar pattern and have a similar amount of zig-zagging. 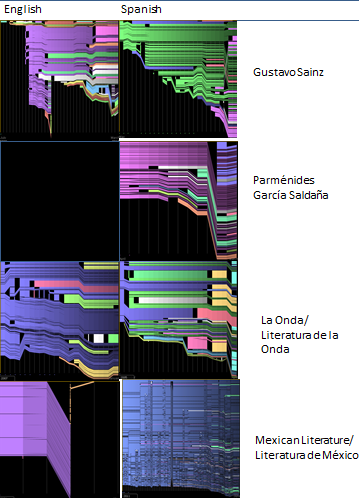 In contrast, The “Mexican Literature” results are the most different (excluding the García Saldaña page, for obvious reasons). Earlier I advised against making conclusions, and I stand by that statement. I think this particular exploratory exercise dwells more in the ludic, and less in the analytic, and I’m okay with that. It’s been a few days since I’ve had time to contribute. I have many excuses (final exams to grade, graduation events, friends moving out of town), but I also think there’s still this child-like joy that one experiences at the beginning of summer that sends one outside, rather than inside by the computer. 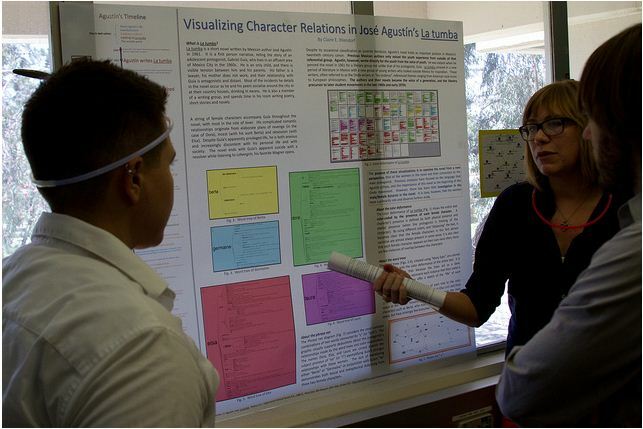 However, this does not mean that I have shirked on my work on visualizations (I’ve just not been a good poster). As Meaghan mentioned, we had our last seminar session and presented some of our work. It was a great session, and I was really impressed with everyone’s work. We started our own project with the knowingly simplified goal of creating a “pretty” visualization and a “useful” one. However, as we worked both with and within our respective texts, we found that the most productive results came from the process of creating the visualizations and not from the actual visualizations themselves. 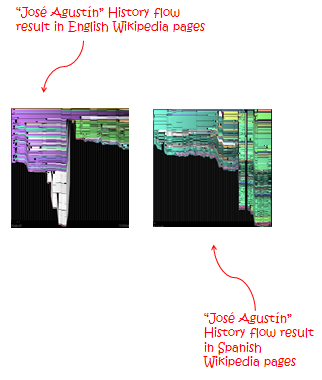 I call it a quilt because I digitally stitched together repeating patterns of the History Flow results of “José Agustín” from both the English and the Spanish Wikipedia sites. I think the result turned out “pretty,” but that is a subjective term. When presenting this image, one of our classmates, Amanda, brought up the question of design, and how much that plays a role in our visualizations. I thought it an interesting question. Essentially, as LuAn has progressed, we aimed to create “pretty” visualizations that are also “useful”, which plays on design’s themes of aesthetics and functionality. When I heard her question, I realized she was right, in that we should pay attention to design, or utilize some tenets of this field. However, I also freaked out a bit. Already with DH you are expected to program, or at least know a bit about programming, you are expected be adept at traditional literary analysis, you should be able to use digital graphing programs and other tools. In short, how multidisciplinary can one be? This summer, in addition to finishing my dissertation of course, I plan to work on refreshing my long lost coding skills, familiarize myself with more “toys” in the toy chest, and now, read up a bit about design. Any reading suggestions? In this post, I would like to bring up something that I know Liz, Meaghan, and I have talked about in person, but have yet to discuss in LuAn (you know, the “cool” way to refer to our blog, Ludic Analytics). The theme of today’s post: Subjectivity. Many of the visualizations that we create are based on a series of rules; regulations that each person as a visualization creator must invent before approaching the source to collect data. In life, I tend to be a rule follower. I’m good at standing in lines, maybe not so good at coloring inside the lines, but overall I like structure. The problem, however, is the fact that when one is creating the rules it’s a) easier to both follow and (occasionally) break said self-created rules and b) one person’s rules will be different from another’s. I’ll give an example to help elucidate the point. Liz and I both have worked on network graphing the dialog in the novels that we are studying (I believe she will post some interesting graphics on her work soon). The other day, she mentioned the problem of judging what is, and what is not, dialog in a novel. With certain genres, such as plays, this is less of a problem. 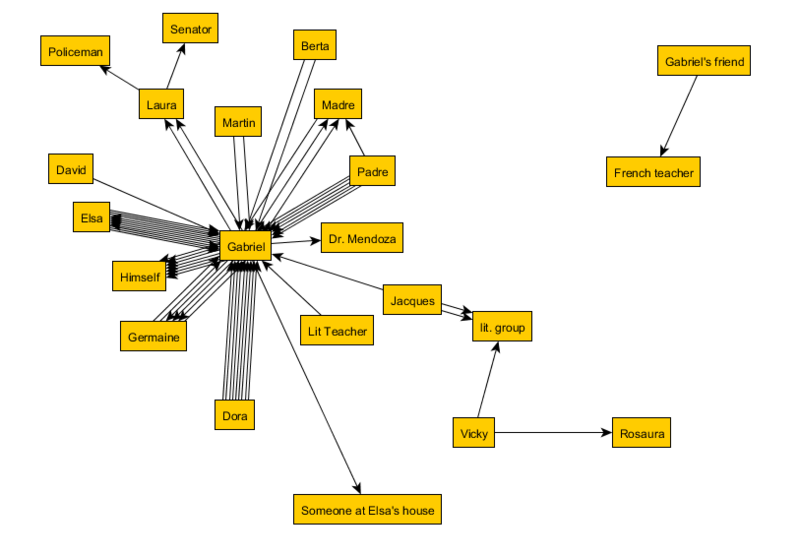 That’s why, I believe, many network graphs of literature are often done on theatrical works, especially Shakespeare (like Moretti’s work on Hamlet). However, with novels, there are different types of dialog, and sometimes it is not as easy to grasp the flow of conversation. 5) The first person who speaks is the speaker, and the other is the listener (meaning that directionally, the arrow representing the edge between the nodes will travel from speaker to listener, even if both actively participate in the conversation). The list goes on. Despite the fact that I created the list, I still found myself in the midst of grey areas. To attempt to find more black/white territory and avoid the penumbra, I would make another rule. This might be an extreme example; I got a bit carried away with the rule making. Yet, anyone who has approached a text for this type of data classifying knows that it can be challenging to decipher different aspects of a text or in this case (to continue with the example) every instance of dialog. In fact, almost all of the work done for this visualization was by hand (excepting, of course, the actual visualization); which, incidentally brings up the other issue of human vs. machine readings. Could I have saved myself the work of manually mining the data? Perhaps. I’m sure some sort of program could be written to do the reading for me. But, would the computer “know” who is talking? Can the computer understand the context enough to fill in the character’s name if it were not mentioned? Yes, but only if I “taught” the computer to do that, and even then, it might not always be right. Also, while I may teach students daily, my methods for teaching a computer (i.e. programming) are not at the level where I could teach it to recognize specific characters. In my case, it was easier to go through the book myself. The result? It was not as exciting as I had hoped, but I don’t know what I expected. After all, in a first person narrative, most of the dialog does indeed revolve around the protagonist, with very few instances (just one in this case) of outside conversations. However, the only slightly surprising factor was how many conversations there are. Twenty-two nodes! I know the novel is known for its use of dialog, but I had not realized how many different people are a part of these conversations with the protagonist. 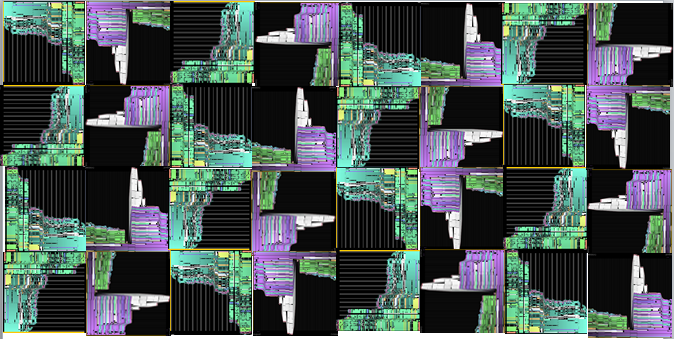 As for the subjectivity aspect of this post, it would be interesting to see someone else’s dialog network visualization of the same work (and based on his or her set of rules). Would this somehow change the appearance of the graph? I assume it would, considering even the presentation aspect was up to me. I picked the color, yellow (seemed like a good choice at the time) and then changed the layout to better see the edges, so it was more aesthetically pleasing (at least to my eyes). The more and more that I work with visualizations, the more I realize how much they are an extension of me: from my methodology in collecting the data, to my interpretation of the data, and finally to my presentation of it. However much I strive to make a logical and objective product, I can never seem to separate it from being a form of (personal) expression. Yet, I continually ask myself, is that a bad thing? I think/hope not. I’d have to say, that from my (new) experience, the best way to enter a three-day weekend is by a casual yet intellectual exchange of ideas and projects. The Research Slam, organized by the Transcriptions center here at UCSB, proved to be a successful event where I got to see what many of my peers are up to and was able to discuss and answer questions about my own work. I had never been to this type of (un)conference before, and I liked the atmosphere. Instead of scheduled presentations and different themes, the style was more “open house” and less “I’m going to read from a paper I just wrote while everyone sits quietly and listens.” In fact, there wasn’t much “quiet” about this event, and I found that all of the discussing and sharing of ideas, made the Research Slam come alive. A few of our other classmates were able to come and participate, and I enjoyed hearing more about their projects for our Lit + class and other areas of interests on which they are working. In particular, I’d like to give “blame” to one classmate for causing my strange dreams about cat/squirrel hybrids (you know who you are). Overall, it was a great experience, and I look forward participating next year, and encourage others to do the same. If you have any specific questions about the event, leave them in the comment box, and I will try my best to either a) answer b) direct you in the right direction. Poster sessions are fairly new (to my knowledge) in the humanities. I know many of my engineering friends frequent them at national and international conferences, and each time they talk about their posters, I still can’t get the glittered and construction papered images of my previous posters out of my head, despite the fact that their posters might be a bit more complex than those my 9 year-old self designed. I see the introduction of poster sessions to many humanities conferences as a positive movement. It creates an opportunity for more students to present and supports a more comfortable environment for communication and discourse. It could be just my own work, but I feel there has been a shift towards a visual culture. Because of this, the visualizations are not just ludic devices, but necessary for current study. My poster is for the research slam (that Meaghan just posted about). It is this Friday. If you’re in the area, come see us! tangents and distractions: friends or foe? I feel like I’ve been working really hard at making a beautiful visualization that is somehow connected to my research about La tumba. However, I don’t have much to show for it. Instead, I keep heading down a rhizomatic path that leads me far away from the productive path (with a destination) that I was once travelling. At times, this is a good thing. It’s kind of an exploratory adventure into the world of visualizations. There’s no end in sight and every article I read and picture I see, leads to another article and another picture. Basically though, I’m getting distracted. However, it’s what I like to call “productive distractions.” I’m not reading the latest gossip blog or checking my email (ok, perhaps, occasionally, that is what I am doing), but instead I’m checking out really interesting projects and discovering that this world of graphic representation is so much bigger than I first thought. To put it plainly: there are a lot of cool people out there, doing some really cool things with data. Since I have alerted all of my friends about my recent research topics and goals, they have been sending me links to things they think I might find interesting (thanks, friends!). This is excellent, but it continues to add to my distracted reading list. Most recently, my good friend Nora was nice enough to send me a link to a book I will have to add to my Christmas in July list (I say 7/25 because I don’t know if I can wait until December). Please enjoy reading the review of the book, and make sure to add an additional hour or so to browse the other posts.